As part of the Total Service offered by Enterprise Tondelli, we supply stretch blow moulders for low to medium speed lines. 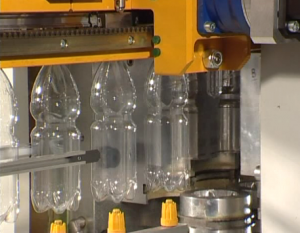 The machines which are used for PET, PP and PLA bottles are based on the two stage process with bottle being blown from performs. 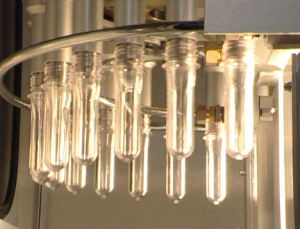 Typical applications include beverages both still and carbonated along with edible oils, cosmetics, foods and other products that demand a high quality transparent container. Additionally with the continual pressure on margins and the high cost of transport it can give a real advantage to have blow moulding on site. 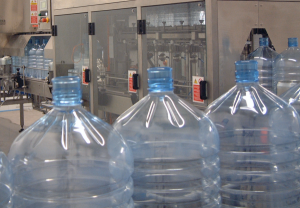 It can also reduce the required bottle stock holding on site saving storage costs and allowing for greater production flexibility if the bottles are produced in-house. Our manufacturing partner in Italy can supply from a single mould machine up to 14 mould blow molders with a speed range from 600 bottles per hour to 24,000 bottles per hour depending on size and perform weight etc. All of the machines are in-line in their design resulting in a very simple and easy to operate unit without special skills. The in-line design also results in a very favourable cost/output ration resulting in a much better payback scenario. A key feature of the supplier is the fact that all parts are made in-house allowing full control of both quality and delivery. A range of machines sizes are available for standard, heat set, wide mouth jars and large containers. Single mould machine. This has been specially developed for the water cooler industry. Containers being blown are 5, 8 and 10 litre bottles as well as 5 gallon. There are also new applications in the beer industry for th is type of blow moulder. Two mould machine can handle from 250 ml up to 10 litre and gives an output of up to 3,400 bph on small containers. Seven/eight mould machine and fourteen cavity machine. This unit is aimed at the 250ml – 2 litre markets and medium speed lines. Key features of the unit include servo motor control and special attention to the bottle carriers to reduce maintenance and running costs. Accessories such as a bulk perform feeder from pallet bins can be added along with an air recovery system. Modems for full support are also fitted. Part of the service includes mould design and consultancy and this coupled with a modern factory specialising in only this type of equipment gives a real alternative. Enterprise Tondelli can supply the complete package including the high pressure air compressor, mould chiller and racks. This item of equipment complements the ability of Enterprise to supply from single machines to turn key factories- contact us for a cost effective proposal.